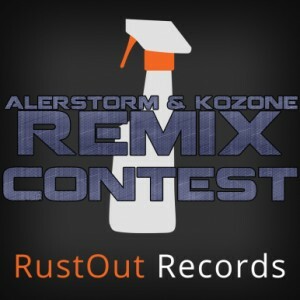 Prize: The winner’s remix is going to be released on RustOut Records as part of the “Alerstorm – Hook (Remixes)” or “Kozone – Explore (Remixes)” which will be promoted through the RustOut Records network and distributed on all major outlets. The winner have chance to release a single, an EP or an album via RustOut Records. Rules: You can only remix one track. Each remixer must use at least some of the given stems, for it to be considered a remix. All genres accepted. Do not have your remix available for download anywhere, until the competition is over and the winner have been chosen. Participants that enable free downloads on their remixes during the competition will be automatically disqualified. Un-cleared samples are not allowed to be used and any entries that do so will be automatically disqualified. Licensed sample packs are fine as well as your own synth patches and presets. Remix Parts and Submission Method: The remix pack can be downloaded from RustOut Record’s Facebook page after you ‘Like’ them. No Facebook? Click here. Completed remixes should be added to this SoundCloud group as a 320kbps MP3 with either “Alerstorm – Hook” or “Kozone – Explore” in the title. Questions and Best Method of Contact – [email protected].